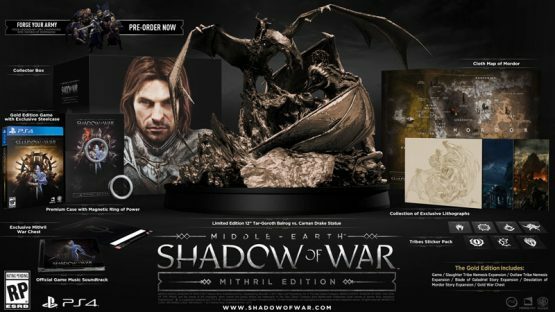 Middle-earth: Shadow of War was announced earlier today for PlayStation 4, Xbox One, and PC, and the official website has detailed the pre-order bonuses, special editions, and post-launch DLC. By pre-ordering any version of Shadow of War, you’ll receive the Legendary Champions War Party (includes four Legendary Champions from different tribes for your Army) and the exclusive Epic Sword of Dominion. Additionally, pre-ordering either of the special editions through the PlayStation Store in North America gets you a Shadow of War theme. Shadow of War releases on August 22 in North America and August 25 in Europe. The gameplay reveal will happen on March 8.